Song debut: Pyrexia - "Infliction"
Whenever a death metal band that’s been around since the early ’90s releases a new album, their promotional materials inevitably call them “legendary.” The word has suffered considerable misuse in this way; is a band that released one demo in 1989 and then stopped really “legendary”? But you can make a more plausible claim that Pyrexia have generated a legend here and there. Pyrexia arose from the same era, and indeed the same Long Island streets, that bred Suffocation. Though one of the two has obviously done a little better for themselves since, the bands have swapped members several times over the years. 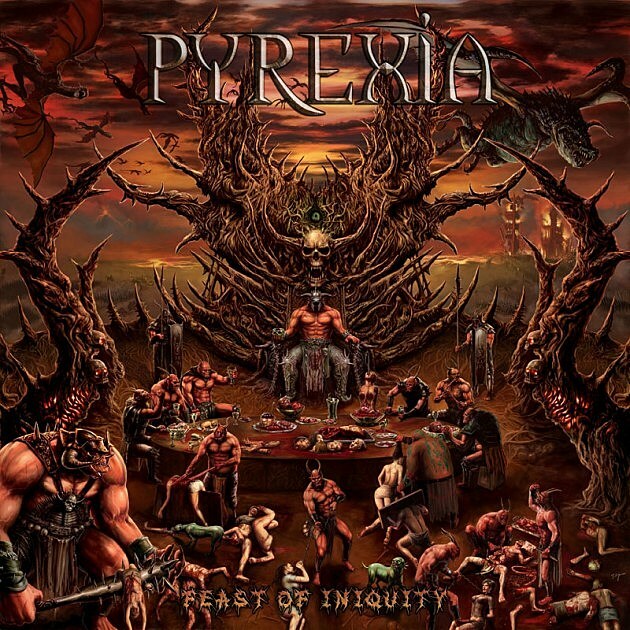 On the new Pyrexia album, Feast of Iniquity (ever notice how metal the “[noun] of [concept]” construction is? ), Suffo drummers Dave Culross and Doug Bohn each take turns behind the kit. Rhythm team-ups don’t get much better than that. I’ve had as much fun listening to Feast of Iniquity as I have with any death metal album this year. It doesn’t exude atmosphere, challenge my brain, or push any boundaries. Instead, it hits a sweet spot: slightly technical death metal — a beginner couldn’t play this, but a highly skilled amateur definitely could — with burly vocals, lots of groove, and a production that leaves nothing to the imagination. It busts in, trashes your living room, and leaves in just over 30 minutes. For me, this is party music. When you listen to “Infliction,” you can tell that Pyrexia are a New York band. There’s something about the way bands from this area — Suffo, Malignancy, Skinless, these guys — hit the pocket on a half-time groove. It’s one of those ineffable regional quirks, like the way that people from Philly say “water.” Listen for the riff at 2:47 and you’ll hear what I’m talking about. Stream “Infliction” below. Feast of Iniquity comes out on 10/29 via Unique Leader records; preorder it here.